Screen and Print are the media attributes addressed in these style sheets. There are also aural, braille, handheld, projection, tty, tv, and even 3d-glasses. Here are the conditionals found near the bottom of each theme’s style.css. 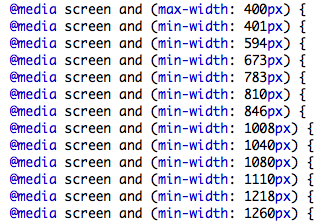 Note: There is a subtle difference between width and device-width. The last theme seems to go overboard, considering that the changes in appearance at the various widths, in areas such font size, margins, padding, and borders are so subtle.